Professional Obama fan Chris Matthews appeared on Friday's edition of the Martin Bashir show to slam the President's critics and to swoon, "Everything he's done has been good for this country." Matthews went on an extended rant against those who oppose Obama, theorizing, "...They go back to the old nativist root, this old dark night of the soul thing that people worry about, a black man in a White House. And they start working on that. 'Oh, he's a Mau Mau. He goes back to a Muslim background.'" Indirectly referring to columnists such as Dinesh D'Souza, who have highlighted political beliefs of Obama's father and grandfather, Matthews attacked, "It's using race. It's using the paranoid fear of whites of black males against this President whose life has been spotless, has been the American dream." Yet, when George W. Bush gave his farewell speech on January 15, 2009, the Hardball host did his own theorizing about the then-President and his father: "He was a rich kid driving his father's car. He got to be President because of his father, let's face it, the same way he got into school and everything else, the same way he got his car probably. After an extended bout of praising Obama, Bashir regained control of the show and ended the segment by enthusing, "Chris, I gotta draw you to a close, but that's the best pep talk I've heard for a long time. So, thank you so much." MARTIN BASHIR: In watching you recently, you've been uncompromising in the way you've highlighted the very personal nature of the attacks on the President. BASHIR: Beginning with the issue of his personal faith. Now if you read his books, as I have, he's abundantly clear that he's a Christian. If you ask him the question, he says his faith rests in Jesus Christ, the Christian gospel and yet not a day passes without somebody suggesting the man's a Muslim. Now, why? MATTHEWS: Well, let me get to the heart of that. I'm going to talk about it on my comment tonight and it's going to be very tough. When you start talking about the Mau Maus of the 1950s, when you talk about revolutionary black Africans killing white people, you're reopening, you're really ripping the scab off of an old wound in America, the fear of southern whites of a slave revolt. That's exactly what you're talking about. You're talking about Nat Turner is what you're talking about. When you talk about Mau Maus of the '50s, you go back to the this guy's grandfather experience, a grandfather he never met, a father he only barely met. I think one occasion. And using that as some sort of predictor, as Newt Gingrich would say, of this man's behavior and policy is horrible. It's using race. It's using the paranoid fear of whites of black males against this President whose life has been spotless, has been the American dream, all merited by him and his hard work and his commitment to get ahead in life and going to Harvard Law and becoming head of law review, not going off and making a ton of money, serving the country. Everything he's done has been good for this country. And then to go back and try to use this ethnicity against him, and in fact, as you point out, that isn't even accurate. Not only is it not only- not only is he not part of the Mau Mau revolt, and knew nothing of it, except what you and I know from reading, he knows, probably as much. And to try to play the religious card too. I mean, religion, we have no religious test. It's written in the Constitution. He has expressed himself as a Christian rather beautifully. And, by the way, on the American front, no one has ever been more beautiful in their description of American exceptionalism than this President. From the first time most of us met him, when I first really got to know him in 2004 up in Boston at the beautiful speech when he talked about his life in saying only in this country is my story possible. Has anyone ever said it better? BASHIR: I don't believe they have. But it does seem remarkably hypocritical that some of those who smear his religious beliefs, they call themselves Christians. Now, what kind of Christian is it that is happy to peddle complete falsehoods, utter lies, about the President? MATTHEWS: Well, I guess you have to have three marriages to start with, if you're Newt Gingrich. I don't know what the roles are these days about hypocrisy. You used the word. I mean, give this man a break, who doesn't need a break, and maybe you'll get a break. If you're asking for forgiveness from God or the people like Newt Gingrich is, how about starting with a guy who has done nothing wrong and stop attacking him? Stop going after him through his ancestors, if you're going to be Christian, act it. MATTHEWS: And if you're going to ask if a person's a Christian, how about being one yourself in terms of your own behavior. And I don't think anyone thinks it's fair what happened this week. George F. Will, who I respect for his thinking, even if I don't agree with him, has a column coming out on Sunday, his syndicated column, and he has 500 newspapers he's in, George Will said, this is destroying the Republican Party. This weird kind of talking, this strange kind of behavior, where you have a good economic issue to fight. There is a concern about a serial decline in American hopes. There is great things to argue about. The whole industrial part of the country in the northern Great Lakes region is suffering badly. There's great issues to be raised. Instead they go back to the old nativist root, this old dark night of the soul thing that people worry about, a black man in a White House. And they start working on that. "Oh, he's a Mau Mau. He goes back to a Muslim background. Let's start working that old vein again, that good old nervous paranoid vein again" The fact that they're doing that makes you wonder why they're running. BASHIR: But, Chris, they're not- But, Chris, they're not- Chris, they're not just stopping with him, are they? Because they've gone for the First Lady as well, with individuals criticizing her choice of food for the White House Super Bowl party, suggesting she doesn't seem to be listening to her own campaign against obesity. Again, you said, in one of your commentaries you saw this as a malicious, ethnic attack. What did you mean by that? MATTHEWS: Well, I think that- Let me just, first of all, make it clear: 80 percent of this country has behaved in this whole process of looking at Barack Obama, judging him as a possible president, beautifully. They have done it post-tribally. They have not said oh, he's got a name Hussein, his wife's African-American. They say, you know what? We need a hot hand. Just like when you pick a basketball player or a football player or any kind of person to perform, a CEO, you look for the person who might be the best at the job. That's so American. And they look at him and say, you know, he's a better bet than McCain. That's a simple fact. This guy's a better bet to bring this country back and lead us into the future than John McCain. There's nothing wrong with John McCain, except this guy's a better bet. That's a great, American way to chose. Who do you put in the game? The guy's that going to score the points. Who you going to put out to lead the country? He's the best bet right now, I think, personally, looking at field. There may be some other candidates that come along the way that grab my attention, but in all objective honesty, he's got some talent. He's been very useful. 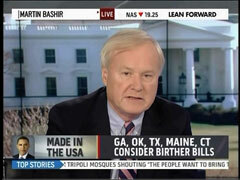 BASHIR: Chris Matthews, Chris, I gotta draw you to a close, but that's the best pep talk I've heard for a long time. So, thank you so much.